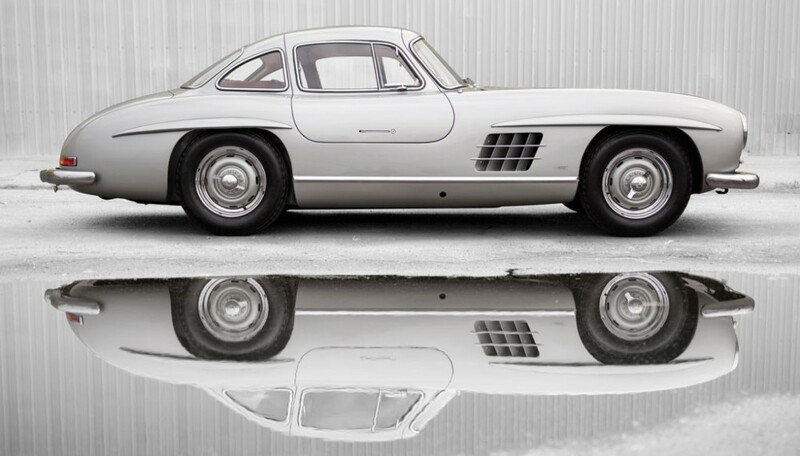 Just in time for Christmas, a classic silver grey 1955 Mercedes-Benz 300 SL Gullwing is now up for auction – with no reserve. Best known for the distinctive gull-wing doors and its direct fuel injection, in its day, this postwar model was the fastest production car and the first iteration of the SL-Class grand tourer. 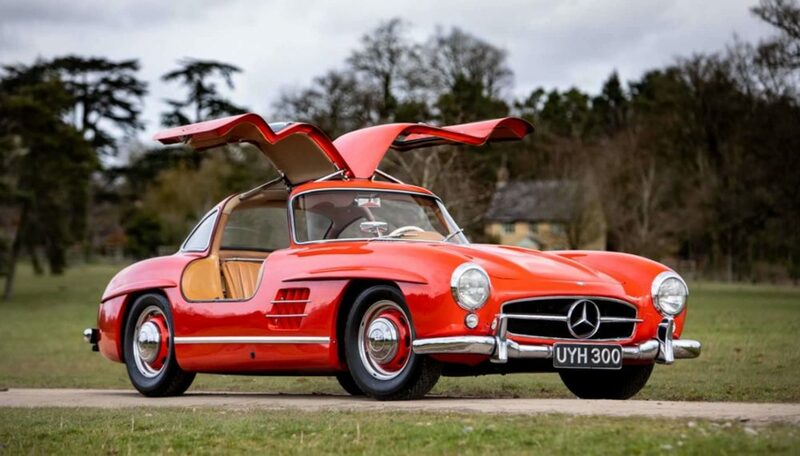 This particular 300 SL had its first hime in New York with owner Ambie Collins before heading across the Atlantic in 1979 to join the Wiesenthal Collection in Vienna. The car still has its W-7990 number plate issued on February 28, 1979, making it likely to be one of the last Gullwings in the country with a black plate. The model, with matching numbers, was meticulously restored in the ’90s with thorough documentation, replacing its original checker print interior with black leather. 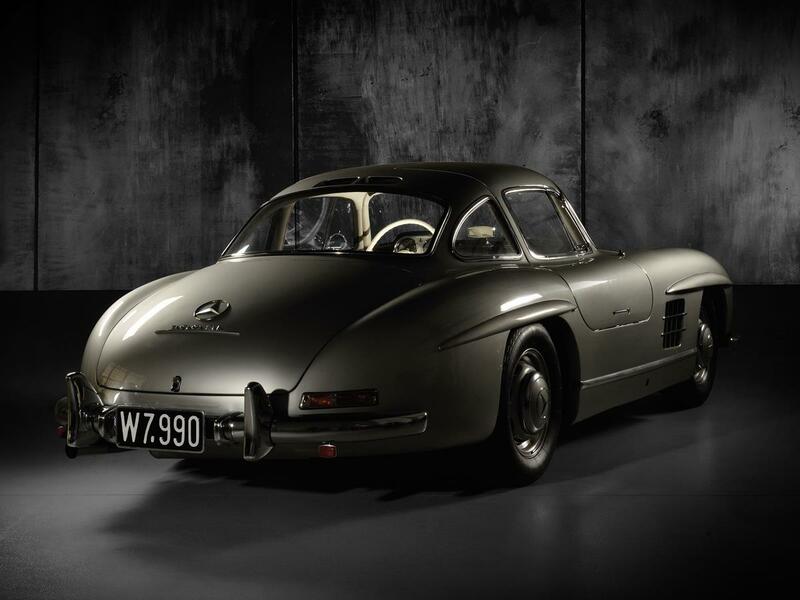 Take a look and place a bid on the 1955 Mercedes-Benz 300 SL Gullwing at Dorotheum auction house. Mercedes watched the new World Automobile Championship in 1950 with great interest. Ultimately, the competitors from the past placed their bets on the cars from the past, and the miracle cars from those days that were gathering dust in the cellar, thought to still be able to win as they had done back then. Nobody wanted to embarrass themselves, however, so the old race cars were first tested in South America, away from the big stage. And all of a sudden, that their former dominance was shattered. A new ruling that considerably cut down cylinder capacity for Formula 1 in 1952 meant that new developments were in order. As a result, executives decided against Formula 1 and for the World Sportscar Championship. All well and good – but they did not have a car to race in that, either. With the new 300 series Mercedes had shown the world that they were once again the people to beat in the superior class. Its 3-litre engine had potential and could actually get up to 170 horsepower. However, the unit was heavy, which meant that the body had to be light. An aerodynamic body made of light aluminium with a drag coefficent of 0.25 was shaped around a skeleton of a spaceframe. The frame itself weighed just 50 kilos. 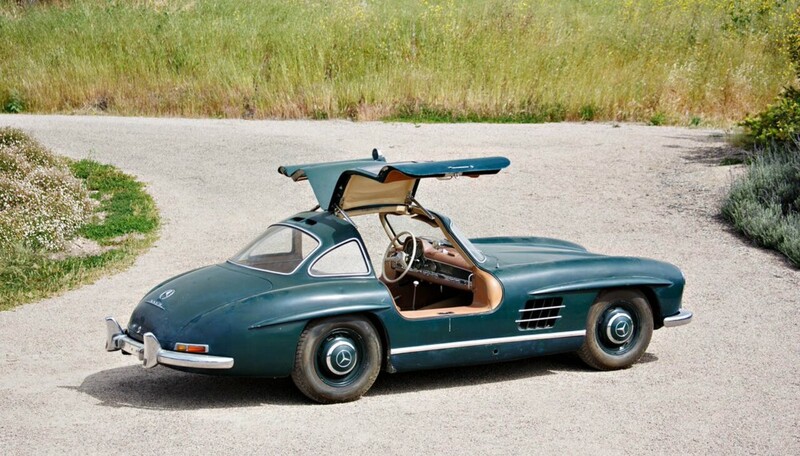 Standard doors would have taken the stability away from the construction, but the problem was solved by giving the 300 SL race cars the characteristic that everyone remembers them for today: their gull-wing doors. It was not long before it enjoyed success on the race track. No matter whether at the Nürburgring, Carrera Panamericana or at Le Mans, in 1952, the 300 SL won practically every race it competed in. However, retirement was announced as soon as the end of August for the ten race cars that had been built. Ultimately, Mercedes wanted to return to Formula 1 in 1954. It looked like the 300 SL’s fate was sealed before it had even properly got started. A fresh approach was taken to the situation in December. Rudolf Uhlenhaut wanted to have five cars built for 1953 – after all, there was room for improvement, especially in terms of power. Despite this, the chop came once and for all at the start of 1953. They had won everything, dominance had been sufficiently asserted, and Mercedes could confidently dispense with providing further proof. One of the five cars for which the death knell had sounded was almost finished. This car was now the guinea pig for the Experimental Department. The aim was to make it even lighter, even more streamlined, and above all, even more powerful. While experiments with superchargers had been carried out in the previous year, now fuel injection technology was intended to provide a boost, along with increased compression and bigger inlets and outlets. Work on aircraft engines provided experience in this domain, and the 6-stample injection pump brought it up to 215 horsepower. We have a man from Vienna, who had emigrated to New York, to thank for the fact that it did not just remain a prototype. Max Hoffmann had been importing Mercedes cars since 1952, but he offered much more than that. He was an aficionado of fast cars and had a keen sense of what the New World wanted. 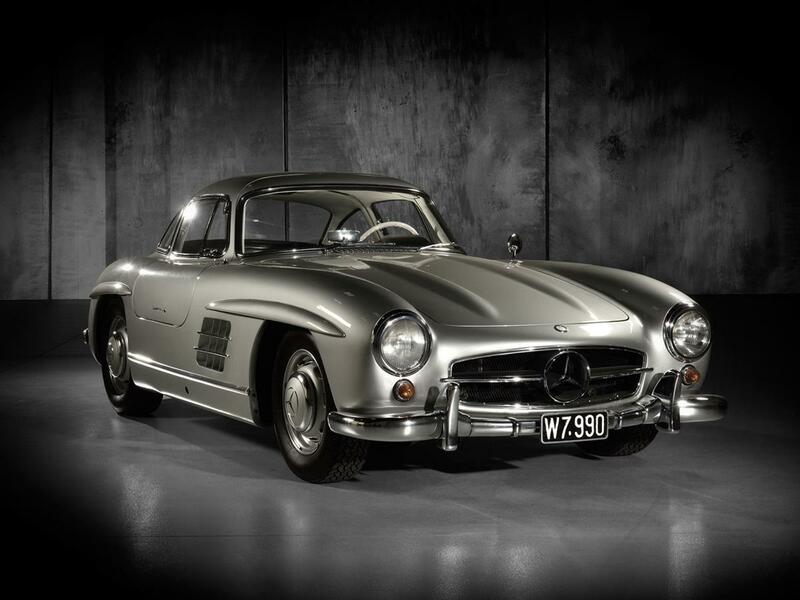 The success of the 300 SL had left an impression on him: the impression that a car like that could make good money. Hoffman begged the executives in Stuttgart to produce the SL en masse, and even ordered 1,000 of them, until they gave in, in autumn 1953. The racing prototypes gave birth to a mass-produced sports car, just toned down where necessary. The SL was given bumpers, and to save money, the light alloy was dispensed with apart from for the bonnet and doors. The gear-box was returned to the front of the car, by the engine. However, the engine was the same injection-based racing unit from the prototypes. It was rocket science when compared to everything else trundling down the roads. 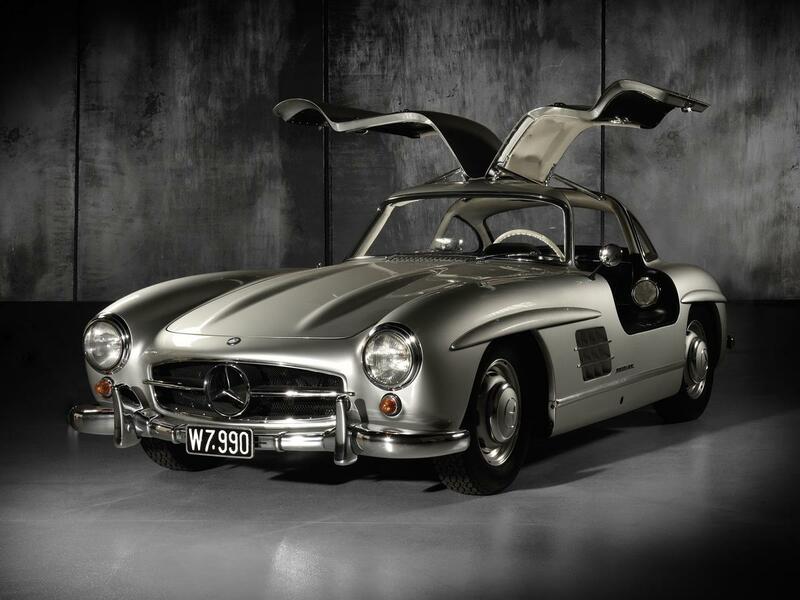 Mercedes unveiled the finished production 300 SL at the International Motor Sports Show in New York in February 1954, along with its smaller, more civilized brother, the 190 SL. Production began in August, but the first cars stayed in Europe – so Hoffman and his New World had to be patient. Despite the eye-watering price of DM 29,000, it became a triumph. With larger numbers built from 1955 onwards, it also enjoyed success, especially in the USA, where the majority of the cars were sold. Precisely 1,400 cars were built in just three years. 29 of them were made purely from aluminium and one had a fibreglass body. 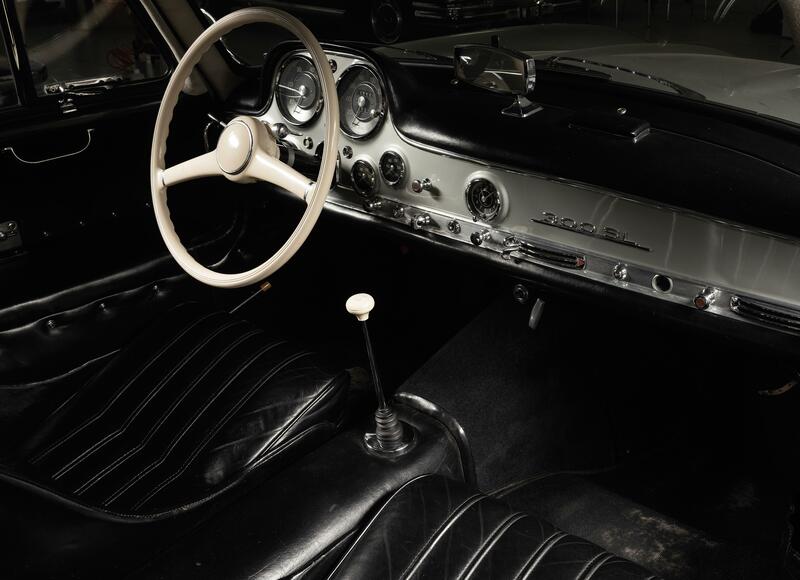 The 300 SL was continuously improved throughout the period it was produced. It had been a legend for years by the time it was replaced by the Roadster in 1957! 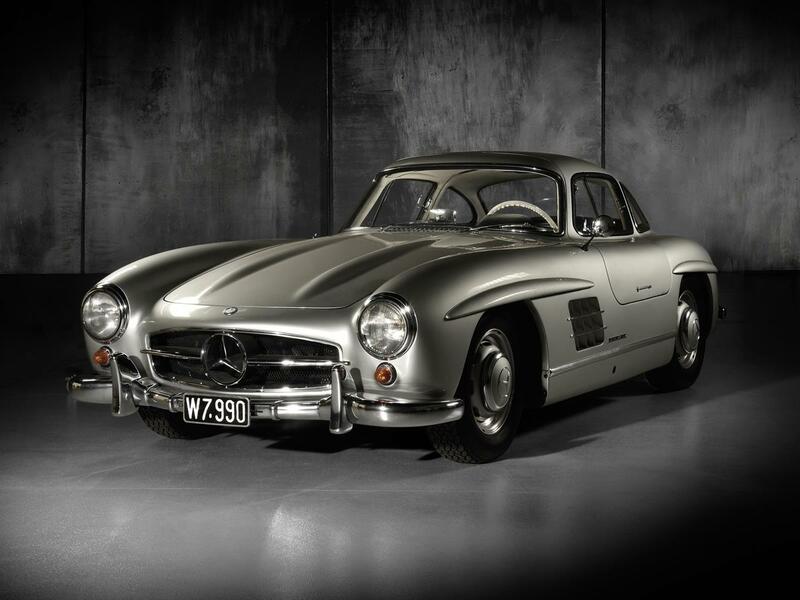 The 300 SL Roadster was revealed in 1957 and replaced the coupé. In terms of design, it was bang up-to-date, and in Stuttgart, they once again exploited their knowledge to the max, giving the Roadster a new rear axle to drastically improve its handling. Later, disc brakes were added, and, finally, an engine block made from aluminium. The Roadster was quite a bit more expensive than the coupé, but it was also quite a bit more successful. 1,858 of them had rolled off the assembly lines by 1963. 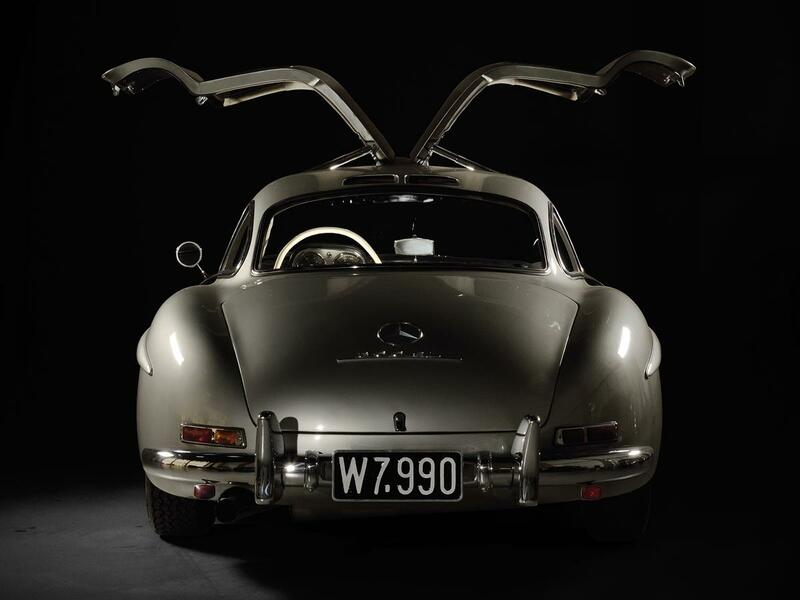 The 300 SL in the Wiesenthal Collection is the 200th car produced in 1955. This year saw 855 gullwings produced, the most of any production year. One reason behind this was that this was the year when supply to the USA really began in force – the country where, thanks to Max Hoffman, almost 80% were sold. This car was also sent to New York in a lightweight shipping box, along with a kilo of paint in its DB 180 silver grey. It was cloaked in this most traditional of colours, as were almost 40% of its fellow 300 SLs. Even the interior was standard, inasmuch as you can say that about a vehicle like this: L1, blue-checkered fabric and L, grey upholstery on the doors. Add-ons came in the form of instruments in English, sealed-beam headlights, bumper guards and an SWF windscreen washing system. This is how the 300 SL arrived to greet Ambie Collins, its first owner, in Port Chester in New York State. She was followed by two more owners before this 300 SL made its way to the Wiesenthal Collection in Vienna in February 1979. It, too, crossed the Atlantic via the network of dealers in the USA. In addition to its open-topped counterpart and the 300 S, it is one of the center pieces of the collection. It still has the number plate issued to it on 28 February 1979: W-7990. This might well make it the last gullwing in the country with black plates. The old photo in the „Einzelgenehmigung“ reveals that the SL was in good condition back then. Even prior to that, in the USA, the interior had been refreshed in black leather: the checkered fabric had not been made to survive for ever. The body was fully restored in the company’s in-house workshop in 1992 and 1993. The work is documented down to the smallest detail with invoices and numerous polaroids, and, 25 years on, its quality speaks for itself. Ultimately, the engine was also completely overhauled at the turn of the millennium. The SL cropped up at rallies time and time again in the years that followed: it successfully competed at the Alpenfahrt, Ennstal Classic and, last but not least, the Mille Miglia. The SL club meeting in Laxenburg was always a firm date in its diary. Covering 20,000 miles in almost 20 years, it has been kept as inteded to. It will take a good while before another car can compete with this one, having spent 40 years owned by the same company. With a wonderful patina on the inside and an outstanding restoration performed on its exterior, its overall appearance is fascinating. The 300 SL has always been more than just an automobile: it is a race car that is dressed for the road, more of a piece of art than a car. Every single one is unique – and this one is even more so!